CCC's Fight Night Round 4 Launch Site: Reviews, Previews, Cheats, Videos, Screenshots, and more! It's the Return of the Champ! It's been a few years since a new Fight Night has graced our consoles, but Fight Night Round 4 promises to be equally as ground-breaking and revolutionary as its predecessor. Physics Based Gameplay Engine� No fight will be the same with an all-new physics-based gameplay engine that recreates the full spectrum of true-to-life punch impacts, giving boxers a devastating arsenal of punches, blocks and ring movement. The new physics system allows for missed punches, glancing punches, knockout blows and for the first time ever, rough and tumble inside fighting. 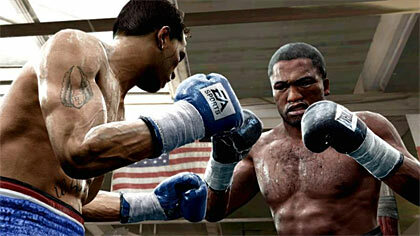 Realistic Boxer Styles � Fight Night Round 4 emulates the styles of history�s greatest boxers like never before. Pressure your opponent with the brawling inside style of young Mike Tyson, bobbing and weaving to set up powerful hooks and uppercuts. Capitalize on Muhammad Ali�s reach, hand speed and fleetness of foot to bewilder your opponent with lightning fast jabs and straights from the outside. Extensive Boxer Roster�The greatest of all time, fighting in their prime. Fight Night Round 4 lets you create fantasy matchups, such as Tyson versus Ali, and finally settle who is king of the ring. With a boxer roster spanning both history and modern times, the matchup possibilities are endless. Additional Major Features - More information to follow in the months to come. Ready to get the most out of Fight Night Round 4? Don't forget to check out our cheats section, where you'll find cheats, tricks, hints, and everything you need to know about secrets and unlockables included in the game. Keep checking back for more!